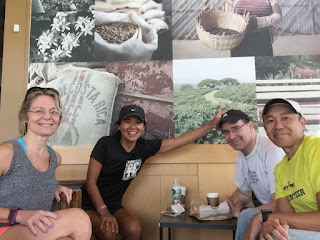 The second half of 2015 had a lot more runs with friends, starting in early July when SIOR and I met up on the Bethpage trail to run a few miles together before heading to Starbucks. TPP was with JC in Connecticut that day and was unable to join us. I ended up covering six miles, my longest run of the year at that point. 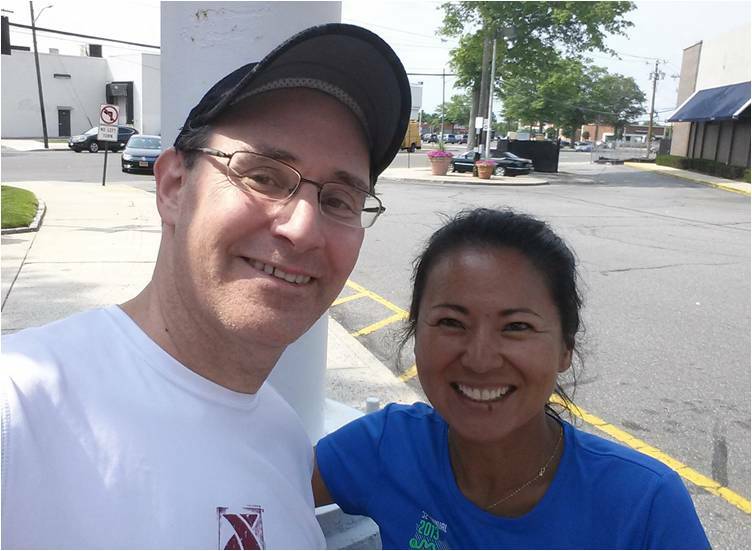 Two weeks later, I met SIOR again, this time to run another six at the Massapequa Preserve that extends the Bethpage trail to the south. I'd run through the northern Preserve before, but had never started a run there from the south. I met up with SIOR once I was three miles in. It was super humid that day and the route seemed to defy physics, with both directions appearing to be uphill. In early August the Runsketeers got together to run the Dirty Sock course at Belmont State Park. KWL joined us on this route that is primarily dirt trails. I stuck to the classic 6.2 mile course and added an extra third of a mile because SIOR forced us to start running before the trail head. 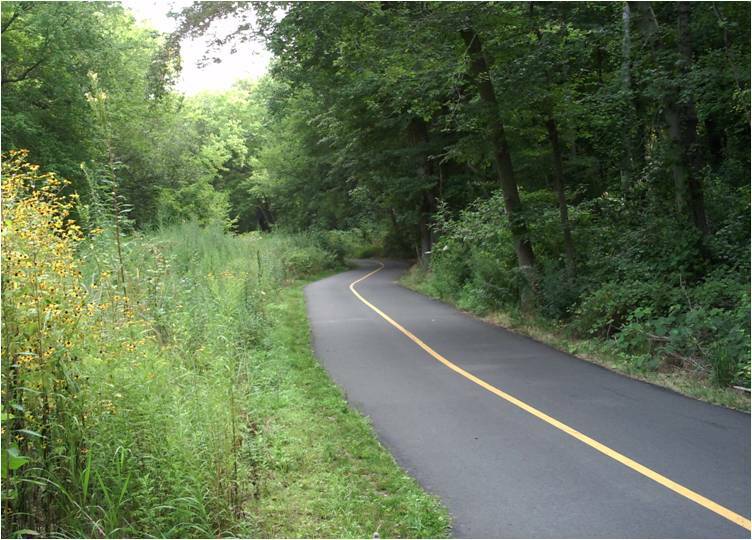 The top of the route is a circle around beautiful Belmont Lake. I circled it once, TPP twice and KWL and SIOR did it a third time because they're the cool kids. 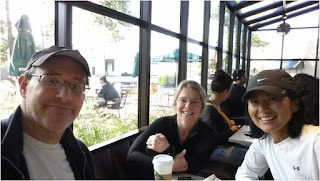 We regrouped afterward at a Starbucks that we found in the area. It had really comfy furniture. One of my best running days ever. 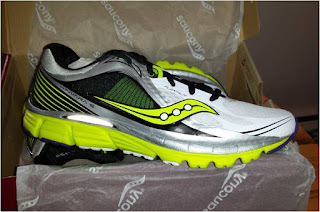 After over-thinking my running shoe portfolio for months, I finally dropped $52 on a pair of Kinvara 5s in September that I bought through a startup app called Shoekicker. It was love at first footfall. I also did a trail run with my financial whiz running buddy Steve at Stillwell Woods. No one bought my theory that one trail mile equals 1.18 road miles. 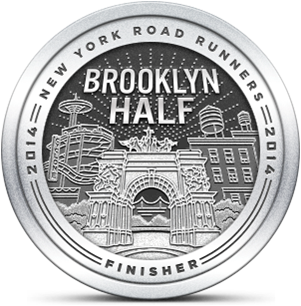 In mid October, the Runsketeers returned to Bethpage. SIOR and TPP were both recovering from hard races and ran slowly. That allowed us to all run together the whole time, something we haven't done in a while. Later, SIOR drove TPP and I back to where we'd parked on Colonial Road. I figured out that five minutes is probably the maximum amount of time SIOR and I can spend together in a moving car. My work schedule did not help my running schedule and I found myself limited to three or four workouts a week. My typical run length had fallen to 3-4 miles and I decided to do something about that. 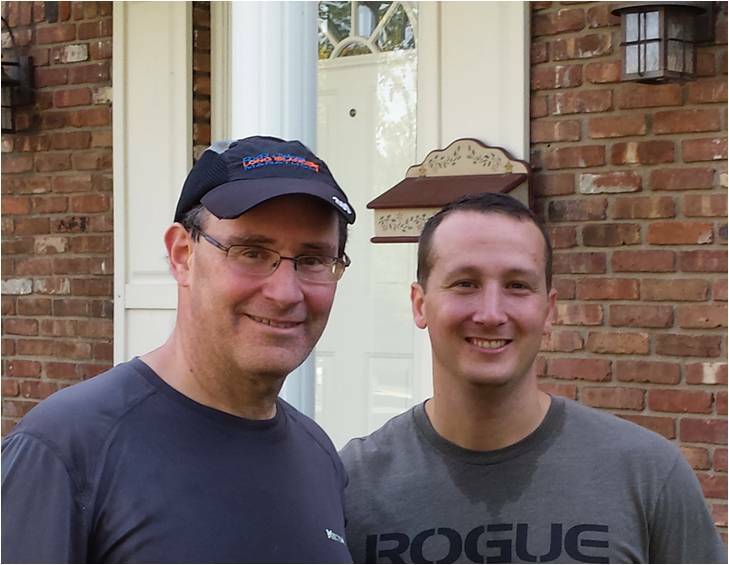 In November, I ran 7.1 miles on the Bethpage trail which turned out to be my longest run in 2015. I intended to do base runs in increasing lengths, but I failed miserably. In fact, I didn't do a single run longer than 5 miles for the remainder of the year. 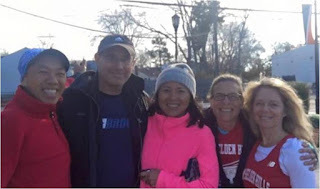 Later that month, the group got together on a chilly post-Thanksgiving morning to support TPP and her sister NIMC who were racing at Stillwell Woods. KWL, SIOR and I ran laps on the track before heading across the street to the start of the race. 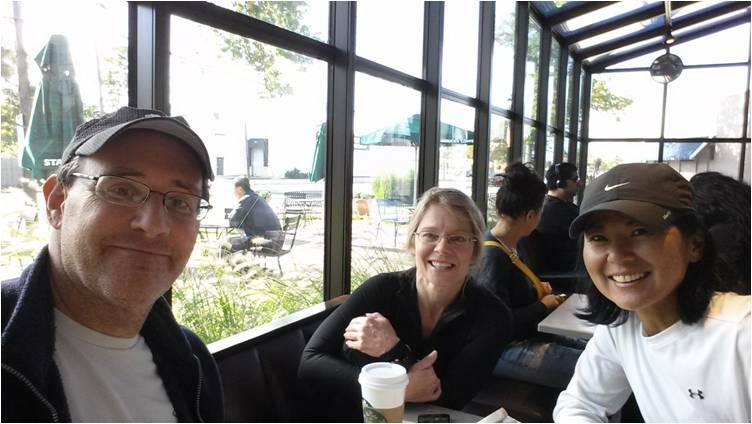 We all ended up at Starbucks where the five of us didn't shut up for a second. 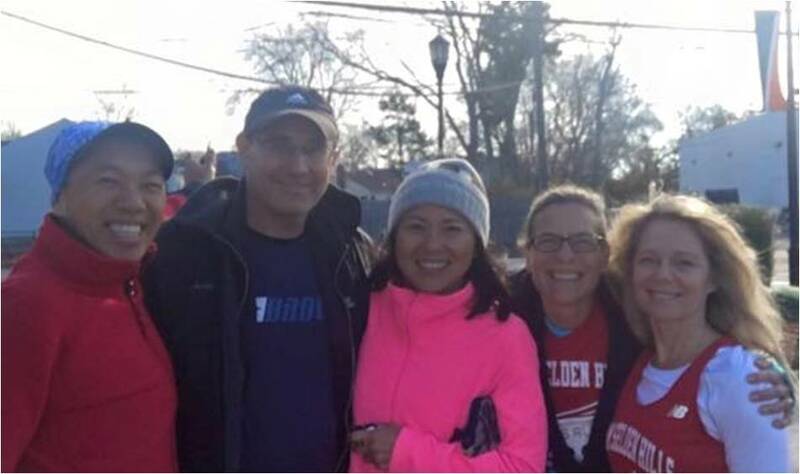 When we finished, we grouped together for a picture that was taken by a metal column. In December, KWL visited the Emerging Runner household for a morning of running and food. Me and KWL headed over to Stillwell for a short but invigorating trail run and later he and the ER family had lunch at a new restaurant in my town that featured intestines and pigs feet. Tempting as those choices sound, we opted for vegetarian offerings. 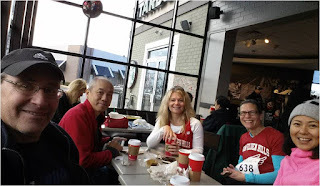 I did 155 runs in 2015 but the best ones were those I did with friends. 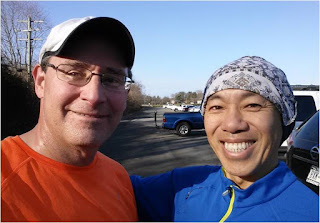 January started off great with the 2016 Hangover Run with SIOR and TPP and I got in a few more miles this morning. I've run every day this year. Let's see how long that streak lasts! Awesome. Let us know so we can plan a Runskevent. That's a lot of runs with SIOR! You had a good year, indeed! Well she is always out running.